Photo of bridge by Wayne Kizziar, used with permission. Back in the day, the Springfield-Des Arc Bridge was an important part of a trade route that connected Des Arc on the White River in Prairie County with Springfield, which was the seat of government in Conway County from 1850-1873. Des Arc was a steamboat landing on the White River. Today, the bridge stands desolate and in disrepair, no longer connecting Faulkner County with Conway County. The bridge is approachable by foot — only through an array of weeds and bushes littered with trash — off Springfield Road north of Wooster in Faulkner County. The Historic Preservation Alliance of Arkansas has placed the bridge on the 2015 List of the Eight Most Endangered Historic Properties in Arkansas (see the website preservearkansas.org). 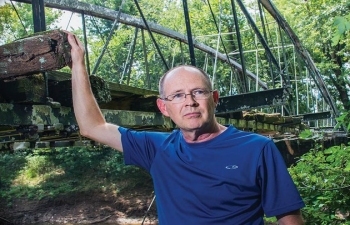 Kenneth Barnes, who teaches history at the University of Central Arkansas in Conway, is a member of the Faulkner County Historical Society, which is trying to save the old bridge that crosses the north branch of Cadron Creek that separates Faulkner and Conway counties. “Preservation experts think that if it’s not preserved, [the bridge] will likely fall into the creek,” Barnes said. He said the iron bowstring truss bridge was built in 1874 by the King Bridge Manufactory and Iron Works in Iola, Kansas. Kenneth Barnes, a member of the Faulkner County Historical Society, heads up the effort to save the Springfield-Des Arc Bridge, which was built in 1974 on the north branch of Cadron Creek, which separates Faulkner and Conway counties. The Springfield-Des Arc Bridge was nominated to the National Register of Historic Places in 1988. Information on the bridge can be found on the Arkansas Historic Preservation Program’s website, www.arkansaspreservation.com. Click on properties, National Register of Historic Places, Faulkner County and Springfield Bridge for a description of the bridge as “an unaltered example of a cast and wrought iron tubular arch bridge” design patented by Zenas King in 1861 and 1866. That report describes King as a “significant 19th-century bridge builder” credited with being the first to develop a practical system for mass-producing bowstring arch bridges. Barnes said several floods have threatened the bridge in the past, especially those in 1882, 1927 and 1982. “In 1927, water was over the deck of the bridge,” Barnes said. “Photographs show the bridge tied to a tree so it wouldn’t float away. Not only has flooding damaged the deck of the bridge; it has also caused erosion around the piers,” he said. Barnes said another threat to the bridge is vandalism. “The bridge is in a remote location,” he said. “People have had parties on and around the bridge and have trashed the area. At least two fires have been started on its deck. You can no longer walk on the deck because of fire damage. The fires have also damaged the trusses. “People do know about the bridge, and some know about its condition. It is this kind of report that has led the Faulkner County Historic Society to get involved and launch a preservation campaign for the bridge. Barnes said there has been much discussion regarding how to restore the bridge and whether to restore it on-site or move it to a more suitable location. “The preservationists we talk to think it would be best to move the bridge to a more secure site,” Barnes said. He said one of the first hurdles the Historical Society had to overcome was the question of ownership. “Who owns the bridge?” Barnes said. “Conway County or Faulkner County? Barnes said another hurdle to climb involves the landowners on either side of the bridge. “We have contacted some, but not others,” Barnes said. “One landowner does not want the bridge removed. “Another question is, ‘How do we fund all of this?’ Now that we have a tentative place for relocating the bridge, the Faulkner County Historical Society will start applying for grants, seeking in-kind services, donations, whatever we can find. Barnes said that is what the Faulkner County Historical Society hopes to do. For more information on the Springfield-Des Arc Bridge, call Barnes at (501) 336-8389. Interested in Faulkner County’s Past? We invite you to also visit the Faulkner County Museum on Facebook! Faulkner County Historical Society freely offers narratives and photos to promote interest and enjoyment of local history. We are pleased when you share our materials with others. Be advised some of the narratives have a copyright and may be shared, but not reproduced for sale by third parties. Some of the images we post are used with the permission of the owner, which we mention. If you use these images you could be violating their copyright if you do not have personal permission from the owner. If you choose to publicly present any material from our website, you agree that you will acknowledge the Faulkner County Historical Society website as your source. Content managed by Faulkner County Historical Society, a 501(c)3 nonprofit organization.